“To the Union belongs the distinction of authorizing the first female military chaplain. After first receiving encouragement from President Lincoln upon expressing a desire to become an Army chaplain, Mrs. Ellen E. Hobart did not receive the same welcome from Secretary of War Edwin Stanton–despite a signed note of approval from Lincoln himself. Though Hobart was an ordained minister and married to a regimental chaplain, Stanton bristled at the notion, stating he did not want to “set a precedent” and then bluntly refused Hobart’s petition. “But Hobart, coming from a rather liberal theological background, had been trained to challenge traditional notions of Christian service and dogma. She continued to work with various Christian aid societies on behalf of soldiers and eventually won the support of Wisconsin Governor, James T. Lewis. After obtaining the endorsement of several other ministers, as well as gaining the confidence of a number of Union soldiers, Ella Hobart was elected chaplain of the 1st Wisconsin Heavy Artillery on November 22, 1864, thus becoming the first female chaplain in the United States military. However, “it would be more than 100 years before the first female chaplain was officially commissioned into the military, when Reverend Dianna Pohlman Bell became a Navy chaplain in 1973. 1From The Essential Civil War Curriculum website. 2Robert C. Stroud, “The first Female Military Chaplain: Ellen Elvira Gibson Hobart,” Curtana,-Sword of Mercy, Vol. 5, Issue 1 (2014), p. 15. 3By Ms. Megan Doyle (Chaplain Corps), originally published 24 March 2014 at www.army.mil. Photo of Ellen E. (Gibson) Hobart: “The first Female Military Chaplain: Ellen Elvira Gibson Hobart,” Curtana,-Sword of Mercy, Vol. 5, Issue 1 (2014), p. 28. 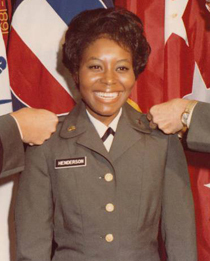 Photo of Chaplain Alice Henderson: http://www.army.mil/women/profiles/historical.html.